The first question you get with any piercing is 'Did it hurt!? ', in my opinion every piercing will come with some degree of pain but with pretty much all ear piercings it lasts all of about 3 seconds. The rook did hurt me more than the tragus but even so, it was a really quick pricking pain and then it was all over, afterwards I just had a slight throbbing for around 10 minutes and a weird feeling in my temple, not a pain, it was just uncomfortable (I don't know if that's normal or not!). My ear stayed red for a few hours and I was advised to leave it a couple of days before cleaning, I'm now just cleaning it once a day with salt water, as was recommended by the piercer and I can hardly even feel it, there's no pain or anything, just a bit of discomfort if I sleep on my right side. Once again I can't recommend Kazbah in Leicester enough, they're so friendly and the piercing guy does everything he can to calm your nerves and talks you through everything - I was in and out within 5 minutes and he's really skilled at what he does so there's minimal discomfort. It is not the worst pain you've ever felt in the world! I know it's all relative, but seriously, it's super quick! IT SHOULD NOT BLEED! Much anyway. If you find a reputable piercing place your ear shouldn't bleed - mine didn't at all so God knows what those other internet people were doing! 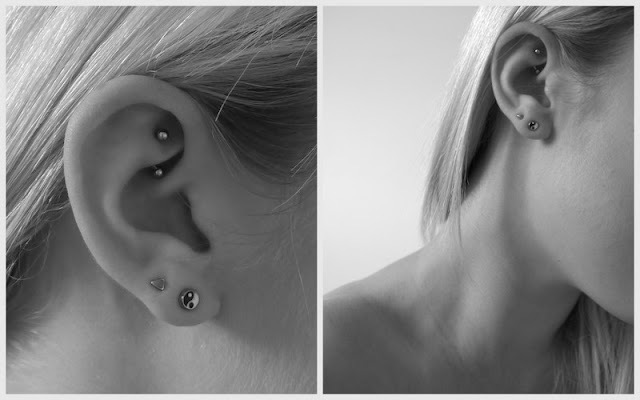 Rook piercings take around 10-12 weeks to heal so just be patient, clean it regularly and obviously, avoid touching it when you can. Usually they should use a slightly longer bar for the initial piercing to allow for any swelling, you can always get a smaller one put in later but it's better to be safe than sorry. All in all, I love this piercing! I think it's quite unique and I haven't seen many people with the same one. It cost me £20 and I think it was well worth it for the quality of service I recieved! love it, i'd be wayyy too scared!! I've got my rook pierced and I would say it took about 9 months to heal, but I've only ever changed my bar once in 6 years cos it aches when you fiddle too much! Ooohh I like it! I think I’m going to get my conch pierced next, I have to admit I always watch the youtube videos though. I have a rook piercing and I'm so in love with it.. probably one of the easiest piercings I've had to deal with too.. good on you! your yinyang earrings looks very pretty! your blog is very good and interesting. i really like your outfits :)) now im following you. follow me back? keep in touch! looks awesome! and I love your earrings!! I absolutely love your blog! And that your accent colour is purple! We love your piercings sooo much. Gives and edgy look to all of your outfits!